The Windows context menu, or right-click menu has been a cool and useful feature in Windows for generations; Use it to send, copy, or print an individual file to a specific location, device, application, or other item; so long some users might love using this power shortcut menu and some users might have forgotten about it. 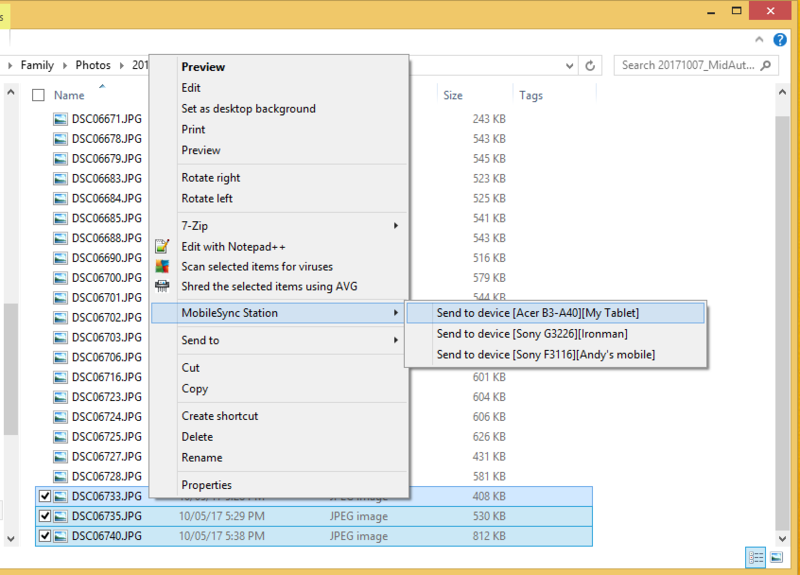 Do you know that you can directly transfer files to your mobile device via Windows context menu without making any USB cable connection? Yes if you use MobileSync Software. MobileSync software are free for single device non-commercial use and moreover they are totally ad-free. There’s a couple of things you need to do before this can happen. First, install MobileSync Station on Windows and install MobileSync App on your Android device. Setup only once and you can easily transfer files, folders and text between Windows and Android. 1. Under Windows desktop or Windows File Explorer, select target files and folders. Right-click the mouse to open the context menu. 2. Locate and select “MobileSync Station” menu entry. The mobile device list will be displayed. 3. Select and click target mobile device and the files and folders will be added to send list of corresponding mobile device. 4. Transfer operation will be started automatically once the mobile device is connected with MobileSync Station through Wi-Fi network.